Welcome to Episode 12 of the Thin Places Travel Podcast. In this episode, we’ll be talking about Kinsale Walks and the oldest Ghost Tour in Ireland. Our guest will be Barry Moloney, a tour guide with Kinsale Historic Strolls. 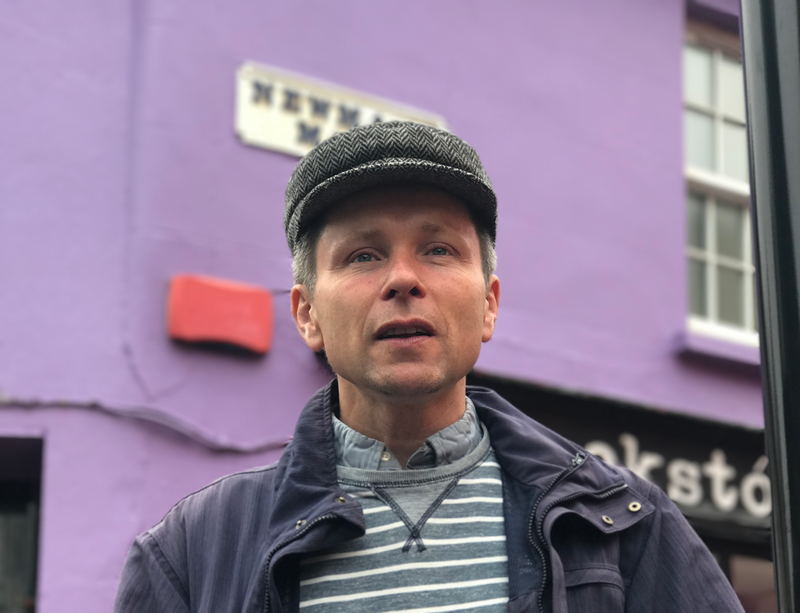 He’ll tell about how Kinsale is a draw for artists and storytellers and a little bit about Kinsale history. We’ll also review the Kinsale Ghost Tour, a part of Kinsale performing events. Kinsale has two historic forts, Charles and James Forts. And so many other bits of interesting history. Kinsale is of my favorite towns for relaxing. I love the vibe. The town is clean, vibrant It’s an art and foodie town. The people are friendly. It’s totally walkable and everywhere you look is color and light. When you go to Kinsale a good way to get your bearings is to go on a tour guided by Don or Barry – on Don and Barry’s Historic Strolls. 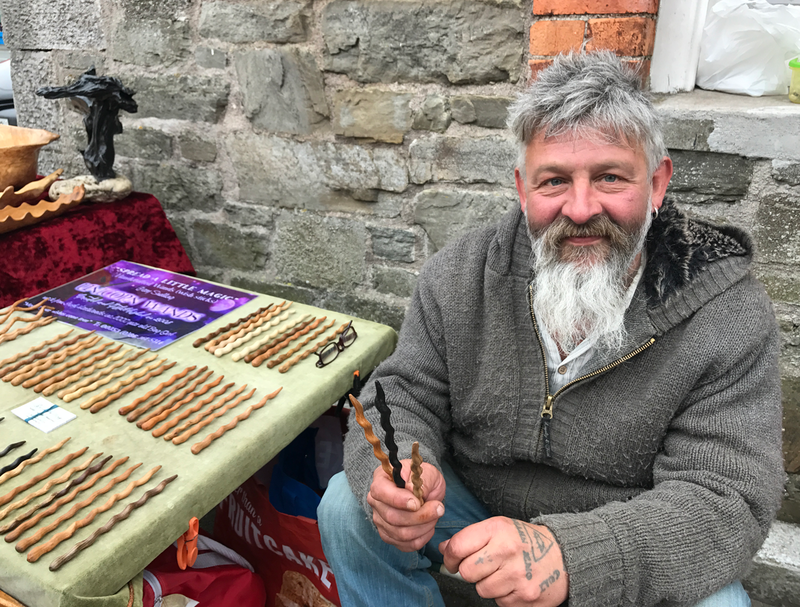 I was lucky enough to get an interview with Barry when I was in Kinsale recently. 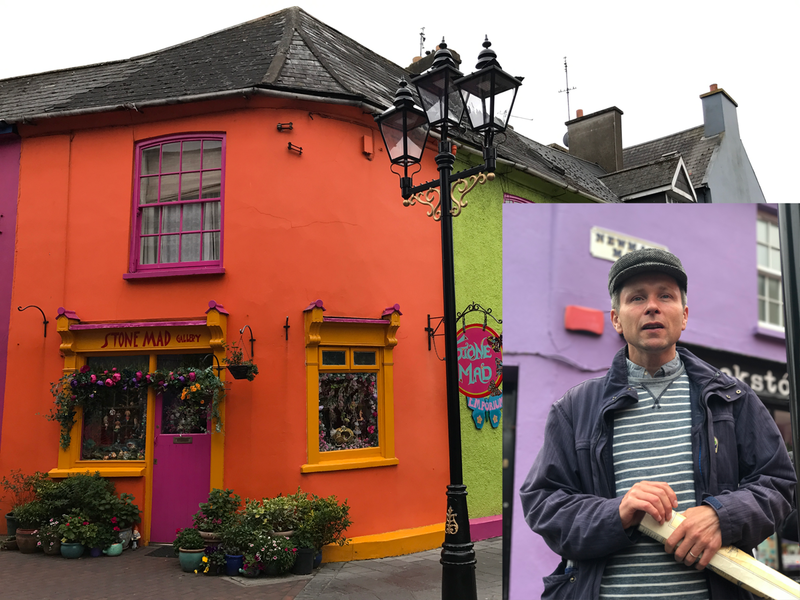 Don and Barry’s Historic Stroll in Kinsale offers a walking tour full of history and interesting information about this seaside town in County Cork. Full interview with Barry Moloney. There are a few consistently operated ghost tours in Ireland. Being the owner of a ghost tour company here in the states, I always like to see what other companies and groups do when crafting and putting on a ghost tour. I’ve been on the ghost tour in Belfast and the Ghost Bus in Dublin. Both were great experiences through very different. Kinsale has an interesting ghost tour. The term Ghost tour is so subjective. It can have multiple definitions in people’s minds. People can perceive ghost tours as anything from paranormal investigations to history walks to people dressed in character leading a theatrical performance. Kinsale ghost tour is that kind of ghost tour – a performance and it’s quite comedic. Two actors, Brian O’Neill and Don Herlihy dress in character and lead their group of guests around the historic Kinsale town center and recount stories of ghosts and historical figures in way that keeps the guests’ attention and keeps guests laughing. This performance is so well done. And there are some elements of surprise. 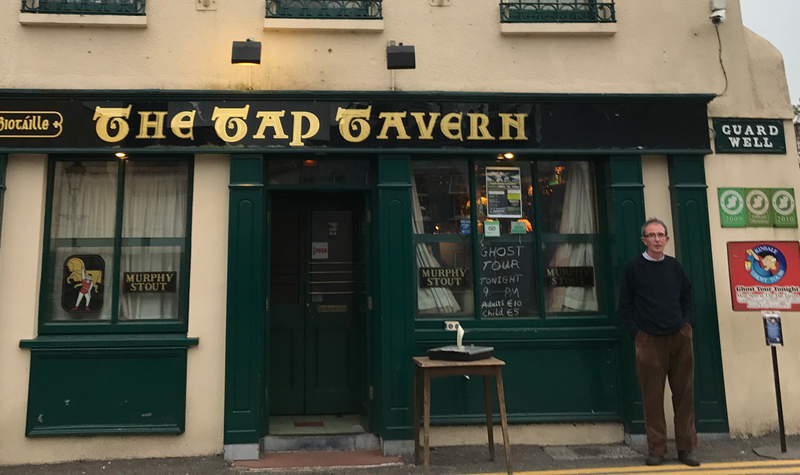 The tour starts at Kinsale’s oldest tavern – the Tap Tavern, which has been owned by Brian O’Neill’s family since 1886. His mother, Mary O’Neill still owns it today and she and Brian manage the operations. Mary is often there when guests gather for the ghost tour. I had the pleasure of meeting her while I waited to speak to Brian. The tour takes about 90 minutes. It covers all the interesting parts of the town and it is very entertaining. An evening well spent. Don’t miss it if you’re in Kinsale. Ardmore is a seaside resort and fishing village in County Waterford. It’s near Youghal in the south of Ireland – not too far from Kinsale or Cork City. Ardmore is a thin place. I guess I sense the thinness of a place on the approach. Maybe there’s something about the round tower, maybe something about the old ruins. But as you climb the hill to the old monastic ruins you get a jolt of something when the round tower comes into view. It’s a seaside town with a beautiful beach and sheltered bay. It’s a resort town for tourists with stunning views of the bay and a cliff walk above the town. The devotional stops in Ardmore are traveled by pilgrims and associated with St. Declan. They include the ecclesiastical ruins up on the hill, a holy well, and a large stone on the beach. According to one of the Lives written about him, St. Declan was born in this region and later went to Rome and became a bishop. 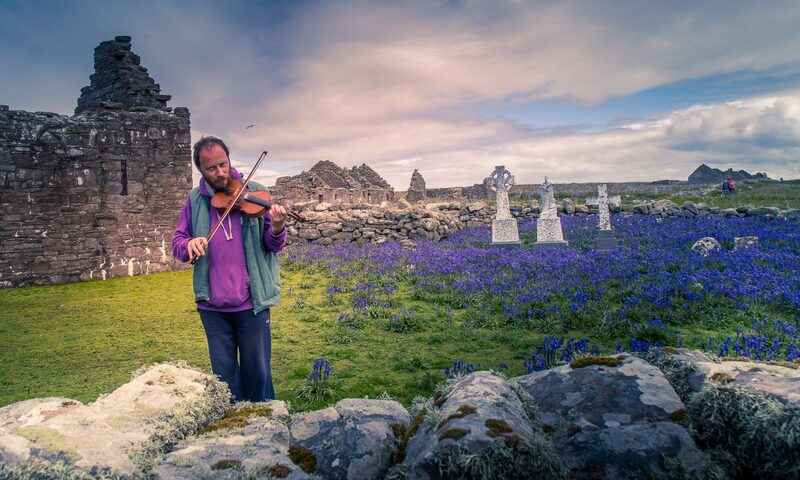 He left Rome and returned to County Waterford – – to Ardmore with plans to build a monastery. However, he left without his bell. A bishop’s bell was similar to his crozier. A symbol of his authority. But because Declan was so special and so blessed, the angels set his bell afloat on a stone that traveled all the way across the sea to Ardmore. It still sits on the beach. It’s a large stone sitting atop two smaller ones and the stone is said to have curative powers for those who crawl under it. But these old legends were begun in a different and told to people who have a different perspective. Thinking patterns were very abstract. 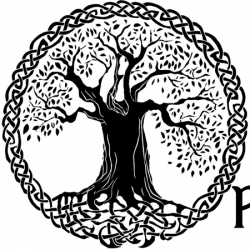 The meaning of the story was rooted in the understanding that an object could connect people in this world to the powers and graces of the eternal world. Maybe that connection brought healing. Maybe it brought wisdom. But being close to these sacred monuments elevates our awareness and spiritual vibration. I’ve stood by that stone and thought about the stories and all the pilgrims who have stood in the same place. I’ve even found one small stone in the shape of a heart on that rocky beach around St. Declan’s stone that I brought home with me. Holding it in my hand 3000 miles away from Ardmore can take me back there in my mind. There is value in these thin places. From the stone on the beach, the pilgrims travel up the main road where there is access to a path that turns into a gorgeous cliff walk. On the path is St. Declan’s Holy well. It is a beautiful spot. The well has clean water (also said to have curative powers) and a little shrine has been built around it with stone. It has an opening for the well and then three stone crosses atop. Actually, that’s only two now. The crosses were said to represent Calvary. One cross on the left for the unrepentant thief, a high cross in the middle to represent Jesus and a cross on the right to represent the repentant thief. Sadly, the cross representing the unrepentant thief has vanished. The locals say it was stolen. … which is ironic. Farther past the well is a pathway that winds along the cliffs with spectacular views of the bay and ocean. Then atop the hill behind the village are the remains of an old monastery. The buildings date back to the eighth century and were placed atop the site where Declan had his monastery in the 5th century. Those building – likely made of wood are long gone. 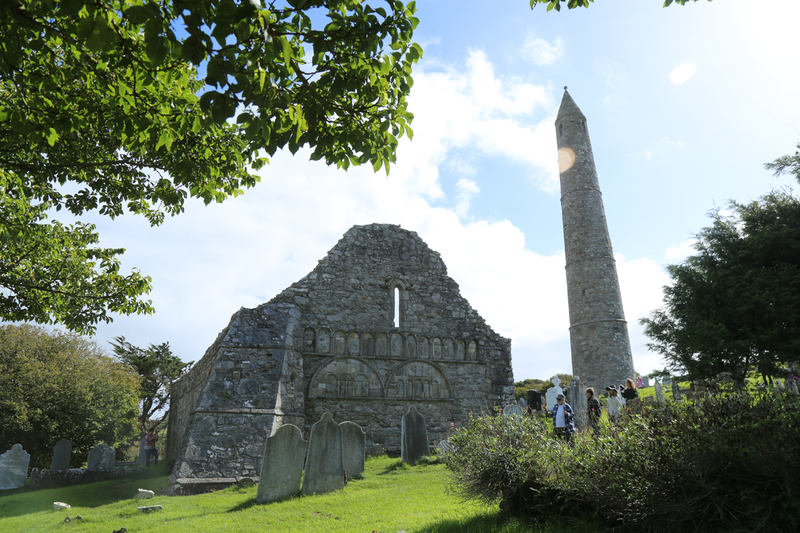 The oldest of the ruins is St. Declan’s oratory which is said to have been erected overtop the remains of the saint. There is also a 12th century round tower which is in beautiful shape. It’s about 100 feet high, which is typical for round towers. Human remains were found facing east below the Ardmore’s round tower, which indicates that it was built over graves in a graveyard. There’s a sorrowful tale associated with the round tower. It was a refuge for Irish being pursued by English forces. About 20 of them were holed up in the tower on various floors. They surrendered and were all hanged. There’s also a roofless 13th-century church ruin with a giant 8th century carving from an earlier church attached to the gable wall. The carving nearly spans the width of the gable wall and the designs are similar to what you see on high crosses. There’s an image of Adam and Eve, Gift of the Magi and of the Judgement of Solomon. These were likely used for teaching the local people about the faith. I stood in front of the Gable wall and pointed out the carving to my tour group and they like most visitors, thought the carvings were beautiful. But when I told the story of the Judgement of Solomon to the group in front of the carving, there was a moment of transformation. I said … “You remember the story. Two women claim to be mother to the same baby and they go to King Solomon to get him to resolve the matter. King Solomon said, since you two can’t agree, I will cut the baby in half and give each of you a share. He called for his swordsman to do the deed and one of the women cried out, ‘No. Don’t. The child is not mine.’ And pointing to the other woman said, ‘She is the real mother.’ Solomon in his wisdom knew that this woman who was speaking had to be the baby’s rightful mother because only a mother’s love would be so unselfish as to sacrifice her own her own happiness and endure almost unbearable sorrow in order to save her child. So, Solomon made his judgment and gave the child to the woman who cried out. At the end of the story, the etched images in the gable wall seemed to have so much more depth, meaning. There’s something about marrying the spoken word of a sacred story to a physical image that represents the story. Something greater than the sum of those two elements grows. It becomes an experience. One of the guests said she imagined the artist, what he was thinking as he carved those images so long ago – – and she wondered if he ever imagined people would be admiring his work ten centuries after he carved it. It was such a powerful moment for all of us. Inside the church ruins in a little niche is a very well-preserved ogham stone. This is a tall stone with old Irish writing that consists of etch marks along the sides. These were often personal inscriptions… the name of the person etching the stone – a mark of memory to leave behind. Ardmore may not be one of the top sights that pilgrims seek out, but it’s every bit as powerful as the other sacred sites.